A rectangular body type is characterized by straight hips and bottom, very little waist definition, an average tummy, and a straight shoulder line and ribcage. You may have an athletic build. These halter tops are very flattering when you have this build. Spring is coming and it’s time to get out of those leggings and sweaters. That has been my winter uniform and I’m ready to wear some color and get some sunshine. As a personal shopper, I am often asked which types of clothes look best on certain body types. I have put together a few ideas for the rectangular shaped body. Stay tuned for more ideas. 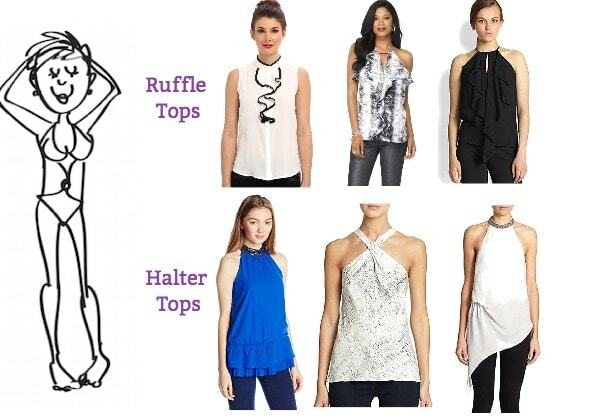 Rectangular or straight shaped figures tend to do well with tops that are ruffled or haltered (or both) along with skinny or boot cut jeans. Not all of these clothes are for those of us on a budget but you can get an idea of what looks best on this body type and find those styles in some of our favorite discount stores. A high end look that can be replicated elsewhere. I think boot cut jeans are universally flattering, don’t you?